On the occasion of the 28th anniversary of the EDSA People Power I, Martial Law victims led by former Bayan Muna Rep. Satur Ocampo filed a petition today asking the Supreme Court to nullify the appointment of PNP Gen. Lina Castillo-Sarmiento as chairperson of the Human Rights Victims Claims Board, the formation of which Pres. BS Aquino announced on February 13, 2014. Petitioners include martial law victims namely Former Bayan Muna Rep. Saturnino Ocampo, Bayan Muna Rep. Neri Javier Colmenares, Dr. Maria Carolina P. Araullo, Trinidad Repuno, Tita Lubi and Josephine Dongail. All of them belong to the almost 10,000 Martial Law victims awaiting recognition as stated in Republic Act 10368, or the Human Rights Victims Reparation and Recognition Act of 2013 signed into law by Pres. BS Aquino. According to RA 10368, members of the Human Rights Victims Claims Board should possess the following qualifications: 1) must be of known probity, competence and integrity; 2) must have a deep and thorough understanding and knowledge of human rights and involvement in efforts against human rights violations committed during the regime of former President Ferdinand E. Marcos; 3) must have a clear and adequate understanding and commitment to human rights protection, promotion and advocacy. “We want to mark it in our history that never again shall we allow perpetrators of human rights violations go unpunished. Letting a Martial Law relic head the Human Rights Victims Claims Board is a betrayal of that purpose. We shall exhaust any legal remedy available so that justice may be served,” Ocampo said. The petition for certiorari concluded that “It is more than an issue of trust between the Human Rights Claims Board and the human rights victims. It is greater than ensuring confidence in the system supposedly envisioned to bring about justice. It is beyond the integrity of the process of arriving at the compensation to be awarded and the standards to be used in determining compensability and linking it to the rightful beneficiaries. The sum total of these values, though important, does not adequately address the issue against appointing a former police general to head the Human Rights Claims Board. 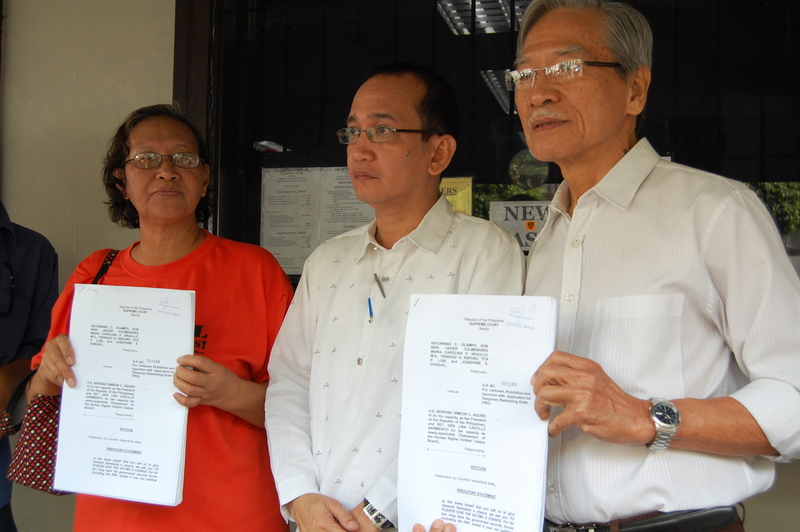 The counsels of the petitioners are from the National Union of Peoples’ Lawyers (NUPL) namely Attys. Edre Olalia, Julian Oliva, Ephraim Cortez and Minerva Lopez. We denounce the appointment of Gen. Sarmiento as chair of the Human Rights Victims Claims Board (HRVCB). After prolonging the formation of the HRVCB for almost a year, the Aquino government made a historical affront to the victims by appointing a former member of the Philippine Constabulary, the forerunner of the PNP, as head of the Claims Board. It is not only her credentials as former PC officer that is an anathema to the historic struggle against martial law, but her zero track records of any involvement in asserting human rights nor any understanding or knowledge ofthe plights and struggles of martial law victims during and after the dark days of Marcos Dictatorship. On 13 February 2014, Malacañang announced the formation of the HRVCB a year after the passage of RA 10368, or the Human Rights Victims Reparation and Recognition Act of 2013. Pres. Benigno S. Aquino III appointed Gen. Lina Castillo-Sarmiento, a retired 2-star general of the Philippine National Police as chair of the HRVCB. To complete the members of the board, also appointed are Jose Luis Martin Gascon, Byron Bocar, Aurora Parong, Galuasch Ballaho, Jacqueline Mejia, Glenda Litong, Wilfred Asis and Erlinda Senturias. The PC and the Armed Forces of the Philippines are the main apparatuses of the Marcos dictatorship in implementing the worst of human rights abuses under Martial Law. It is the PC and the AFP that dispersed rallies, “salvaged,” abducted, tortured, arrested and detained thousands of Martial Law activists. Her presence in the Claims Board does not command respect nor confidence in the hearts of the Martial Law victims. In appointing Gen. Sarmiento, the Aquino government junks altogether the state’s admission of the atrocities and repression used against the Filipino people, the supposed objective of the law. Instead, it promotes into position those who violated the people’s human rights. This is no different from the Pres. Aquino’s appointment of military officials to higher positions under his presidency. BS Aquino’s Claims Board does not represent the victims of Martial Law. The Aquino government completely disregarded the provision in the law which underlines that members of the HRVCB should have deep knowledge, capacity and experience in defending human rights. Not a single nominee of SELDA, most of them widely known as Martial Law victims and human rights champions, was appointed to the Claims Board. Much to our dismay, CHR Chairperson Etta Rosales and DOJ Sec. Leila de Lima even came to the rescue by saying said that Gen. Sarmiento is qualified for the job. However the Aquino government justifies it, the appointment of Gen. Sarmiento goes way beyond the issue of qualifications. It is a travesty of justice. It is a conscious effort to discredit and dishonour Martial Law victims. The Aquino government, which has banked on the people’s clamor for justice and change, is trying to push the people’s struggle for justice farther in the sidelines. The appointment of a PC relic to head the claims board is not only considered a grievous insult to the struggle against martial law but a shameless denial of the ideals in asserting freedom and democracy that was highlighted during the first Edsa People Power in 1986. With its brandishing of human rights violators in the military and the appointment of Gen. Sarmiento, the people who fought the dictatorship cannot expect anything more from the current administration. It is rather just to continue to fight for justice. SELDA demands the immediate recall to Sarmiento’s appointment. SELDA has formed the People’s Claims Board (PCB).This will be the primary body to stand for the victims of Martial Law. It will ensure that all who suffered atrocities during the Marcos dictatorship shall be recognized and indemnified. The PCB will also ensure that RA 10368 will be implemented. It will formulate an Implementing Rules and Regulations (IRR) which will be submitted to the HRVCB as basis of the law’s implementation. The PCB will continue to assert that, based on conclusive presumption, the 2,013 Martial Law victims that were delisted (who were part of the 9,539 members of the class suit against the Marcoses filed in Hawaii in 1986) and thosewho will step forward to make themselves recognized will be rightfully recognized and indemnified. The PCB is composed of individuals actively in defense of human rights, and were victims themselves. They are Bayan Muna Rep. Satur Ocampo; SELDA chairperson Marie Hilao-Enriquez; SELDA vice-chairperson Bonifacio Ilagan; former Gabriela Women’s Party Rep. Liza Maza; University of the Philippines Prof. Judy Taguiwalo; Dr. Edelina dela Paz; Atty. Kit Enriquez, Atty. Marcos Risonarand Atty. Dominador Lagare, Sr. Martial law victims in the regions of Southern Mindanao, Bicol and Panay launched also similar protest actions to express their grievances on the formation of the Human Rights Victims’ Claims Board. “An apologist of human rights violators has no place in the Martial Law victims’ claims board,” said SELDA chairperson Marie Hilao-Enriquez in protest of the appointment of retired PNP Gen. Lina Castillo-Sarmiento as head of the Human Rights Victims Claims Board. Enriquez explained that victims of human rights violations do not deserve an unqualified person, much more a representative of State forces, to head what is supposed to be a mechanism to recognize state atrocities during the martial law period. The Human Rights Victims Claims Board (HRVCB), according to RA 10368 or the Human Rights Victims and Recognition and Reparation Act of 2013, is the body tasked to evaluate and process the application for claims of the martial law victims. “The appointment of an ex-PC officer to head the Claims Board is honoring the Philippine Constabulary that committed grave atrocities during the Martial Law regime,” Enriquez said. The defunct Philippine Constabulary is the forerunner of the current Philippine National Police, which along with the Armed Forces of the Philippines implemented “salvages”, illegal arrest, detention, abduction and torture against people who fought the dictatorship. Aside from being a PC officer under Marcos, Sarmiento was the former head of the PNP’s Human Rights Affairs Office during the Arroyo regime. “The Macapagal-Arroyo regime had the worst record of human rights violations post-Martial Law. Sarmiento’s position as human rights officer under Arroyo is similarly deplorable,” Enriquez added. “Pres. Aquino clearly disregards the provisions of the law which enumerated the qualifications of members of the HRVCB. Gen Sarmiento is bereft of credibility, much more, her deep knowledge of martial law atrocities and empathy to the ML victims are questionable being part of the institution accused of rampant human rights abuses,” Enriquez said. “We do not see any clear basis for the appointment of Sarmiento; only a conscious effort to discredit and dishonor Martial Law victims. We demand a recall to Sarmiento’s appointment,” Enriquez said. SELDA formed the People’s Claims Board that will act both as a watchdog and a monitoring body of Aquino’s HRVCB. The priority of the People’s Claims Board is to ensure that real and legitimate martial law victims will not be marginalized.